I kept my look easy and casual throughout the weekend and kept it up yesterday too (even though I had to work). I spent it with my husband and family in LA (you may have realized that if you saw me on Instagram) so the weekend flew by for me. The weather was in the 80s, which felt great after being in the chill in SF. 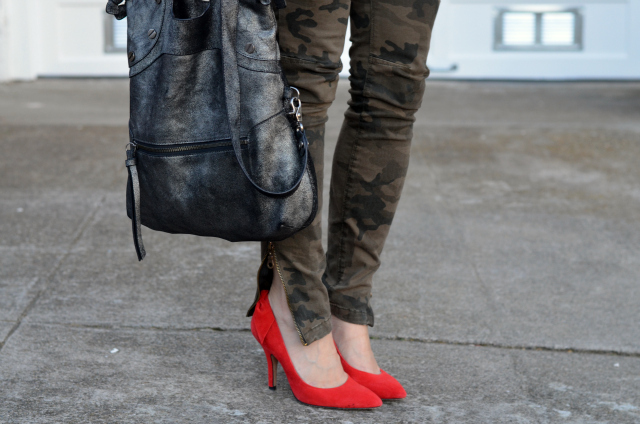 I love your camo pants with the red heels!! What a great look. :) I missed out on those at Zara.. boo.. so sad!! I'm loving this look, doll. 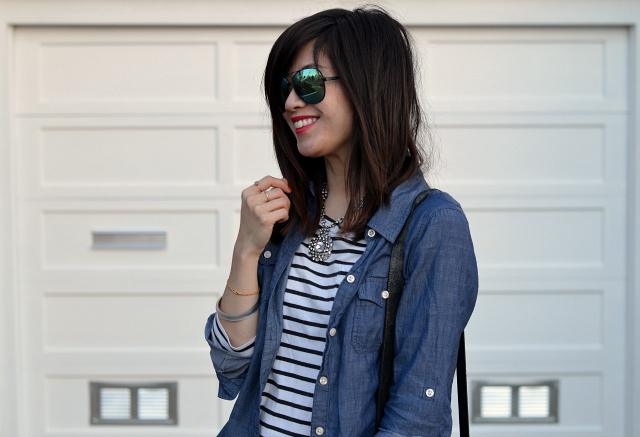 It's perfect- from the red lip + pumps to the stripes! My weekend was spent working- oy vey, work is super stressful lately. Hopefully this weekend will be more relaxing! I always love your casual outfits, you look so effortlessly stylish! Your nails are so cute! Lovin those nails and the pop of red with your shoes! What a great look! ooh, I'm in love with this combo! The red is perfection! This is such a stylish look! I'm loving those red pumps! I love the fancy necklace with a casual outfit, it makes a great balance!! And I don't keep up with football, but I loved watching my high school team play way back when I used to take football stats for our team haha! oh those pants. and with those beautiful stripes! Love the sunnies and pumps. Wow. Favorite outfit ever. I love all the classic layers and elements. It is executed perfectly! go 49ers!!!!!!! can't wait to watch the big game!!! this look is so perfect for the weekend. totally love your nails! are they painted? or press on? adorable! I love the stripes with red pumps! I love your tangerine nails and how they match your shoes. It's fantastic. 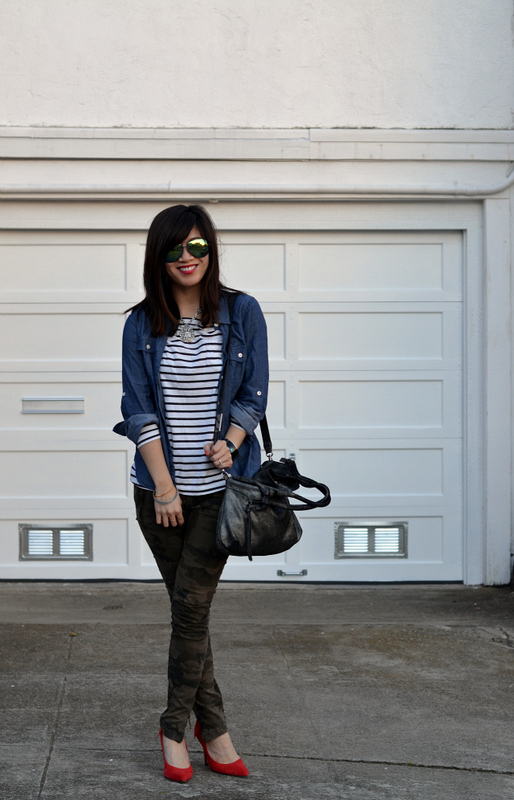 Great casual outfit with the right pop of color! Loving the red heels here. Very cute outfit...and I love your nails! Where'd you get em done? Love that watch! And the color of your shoes...I think I need a pair...sounds like a great weekend! LA is always nice to visit. 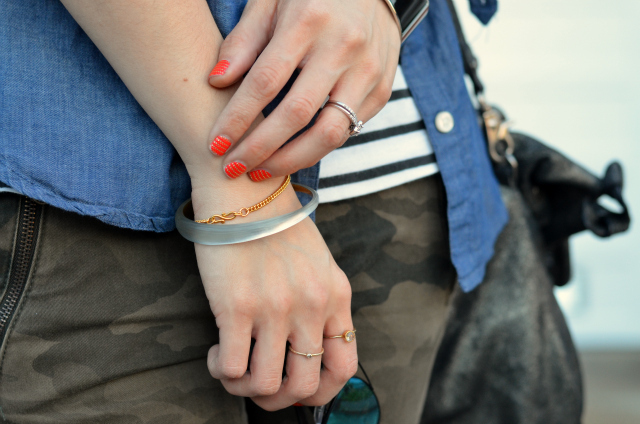 Kind of (totally) obsessed with your mani here! Your heels...I seriously have yet to find a pair i love! I never commit to buying a pair I see in stores or online either! I love the color, red is such a statement color! I love your pants! They look great. I was considering buying these and now I wish I had. 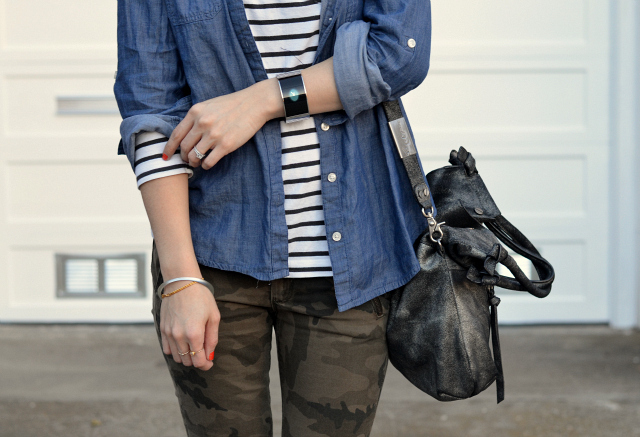 I love stripes and camo together. I really can't believe those heels are from GAP OMW so cute. i love your blog!!! glad to stumble upon it and i've been sorting thru your outfit posts!!!! you look so good in all of them!!! I love how you made this outfit so feminine by adding the heels! Love it! You pretty much paired each piece I love individually...together! I just want to shop your closet:)! Head to toe I'm obsessed - love the pant/shoe combo! Very nice outfit and pics. Great day. This pretty much epitomizes casual chic. 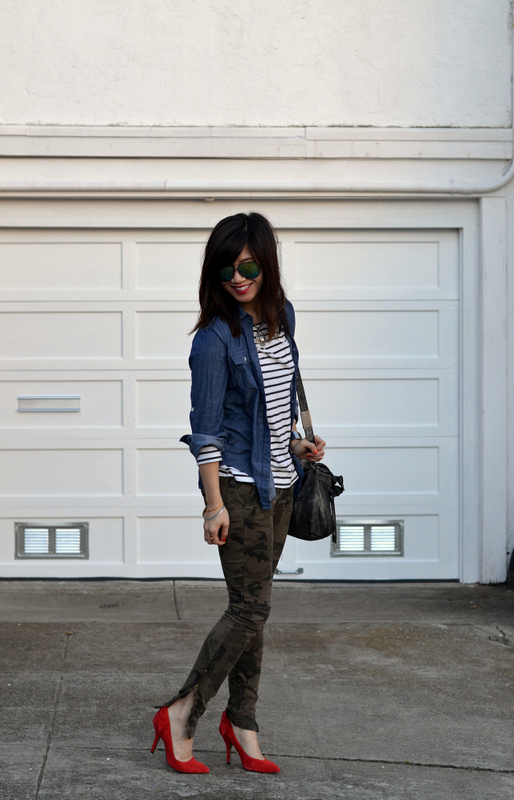 I love the red foxy heels with the stripes tee, denim, and camo! The khaki skinnies go so well with the red courts, would never have thought of it! great outfit nancy! ahhhh, i live in new orleans, so all the media is here. beyonce had breakfast at one of our famous restaurants too. hahaha it's crazy busy with mardi gras going on too. love your outfit - the pants look so great with the red shoes - looove!! This is definitely one of my favorite outfit of yours! You mix prints so well!! 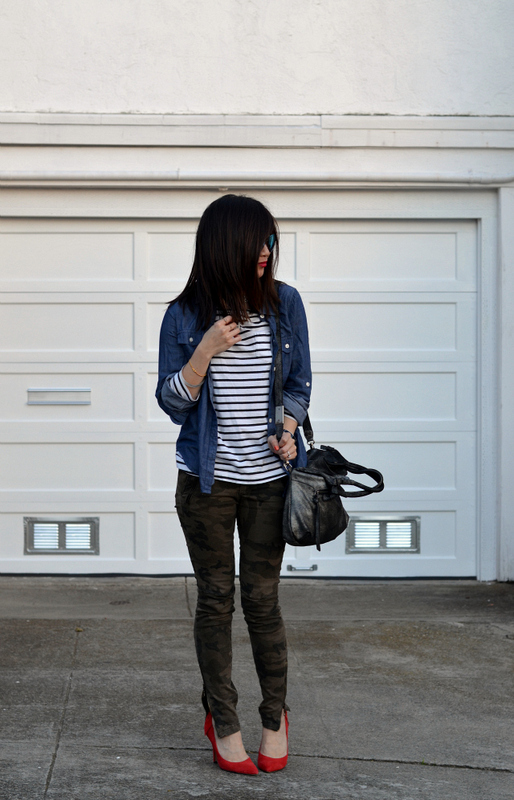 I wouldn't have wore the camo skinnies with a stripe shirt but it looks so good together! I love this 3 pieces look, it is basically my go to look! Thanks for visiting me!